Nongthale resort owners Banyen & Guido gave us a free ride to Ao Nang town and they even dropped us off in front of our new hotel! HUHU. Thanks guys! We miss you already! Ao Nang Easy Room! Booked our rooms through Agoda. Aonang Easy Room is a serviced-apartment. This contemporary style accommodation comforts you with its easy designed-rooms, pleasant service and atmosphere. Its crystal clear mirror decoration allows you to view from inside their green courtyard and also people watch if you want! Haha. So many books!!! Guests could borrow as much as they like. Since we arrived early, we left our things muna at the reception area and went out to eat lunch somewhere near. Had a few bills exchanged again. Rates were mostly the same with other money changers. From Ao Nang Easy Room, just go left and walk straight until you reach the corner. A few steps away is the long tail boat ticketing booth going to Railey and other destinations. More on this below! On our way back and a few steps away from the hotel, we saw this "FAMILY Thaifood & Seafood" Restaurant sign on the street. We got curious so we decided to check it out. This is it! Family Thai Food & Seafood Restaurant. Nico and I ordered seafood fried rice, beef satay and kangkong something. I think we only paid 230 baht for everything! Thai milk tea for life! Across our hotel are establishments such as Starbucks, Mcdonalds, 7-11, banks, convenience store and pharmacy. Aonang EasyRoom consists of 21 well-equipped rooms available for one-day, long stay or more. They provide daily room service throughout your stay. It was my first time to stay at a unique place like this and it's quite an experience! I actually booked the place because I got curious and of course, it was cheap!!! My first impression was that it looked like an abandoned office building. Do you see it? I don't know, that's just me. I love the glass windows and doors! This is their Standard Double room (w/o breakfast) and we paid P4,290 for 4 nights! Quite cheap na din! Sink was also separate which was good because we can do things simultaneously! For example if Nico is doing his business in the toilet (he takes so much time OMG), I can brush my teeth na or take a bath. Hihi. For privacy, you could just fully close the curtains! Blackout curtain to guys so mejo nakakadisorient sa morning LOL. Mag alarm kayo! Saw this huge room with 3 beds! Perfect if you're traveling with your family or barkada. I was craving for pizza so we stopped by this restaurant called Bawarchi Delight. It's an Indian resto but they also serve pasta & pizza! yas! Merchandise are more expensive in Krabi than Bangkok, I think. Ate dinner again at the local food market near the beach. I don't know why I don't have photos haha. We also checked out more souvenir shops before going back to the hotel. The next day, we woke up quite early to visit Railey Beach! To be honest, at this time, we were already over budget and our funds were running low. Krabi is not that cheap, people! Haha. I still have money in the bank but since I allot a certain budget every time I travel, I try not to go over it as much as possible. Nico and Gio (his brother) casually mentioned our dilemma to their mom when they were video chatting and to their surprise, she sent them extra pocket money through Western Union! So sweet! Thanks Mama Gi for saving our broke asses. Hahaha. You can buy tickets to Railey, Tonsai, Phra Nang cave, etc. from this ticketing booth located at the corner intersection of main street and beach road. Long tail boat ticket is 100 baht one-way (8am to 6pm). We paid 200 baht each. Boat dock. This is where you need to go after buying your tickets. Kuya checking our tickets and which boat is available. Someone will then lead you to your boat. Centara Grand Beach Resort & Villas Krabi! And then there it was, the mother of limestone cliff beaches-- hello, Railey!!! Andami ding tao but tolerable naman. You just need to find your spot. Railay Beach (Rai Leh) is a large peninsula between the city of Krabi and Ao Nang in Thailand, accessible only by boat due to high limestone cliffs cutting off mainland access. It is one of the most sought-after beach in Thailand (or the world) because of its simple splendor. Imagine a beautiful 600-meter long pristine beach surrounded by limestone cliffs, framed by towering coconut trees, white fine sand, dazzling emerald water and maintained by friendly locals. It's really something straight from a postcard. Kayaks for rent. I think they also have paddle boards. Aside from sunbathing, napping and lazing around, a lot of other things could also be done here. While Nico was swimming and I was reading a book, our companions rented a kayak for 250 baht per hour. Aside from kayaking, you could also rock climb (this place is frequented by rock climbers and base jumpers from all over the world! ), island hop, hike to Railey viewpoint, visit Phra Nang beach, explore Phra Nang caves, enroll in a cooking class, get a massage, grab a drink (lots of bars in the area), play beach volleyball and watch the stunning Railey sunset! Got thirsty so looked for some refreshment. Fruit shakes for only 50-70 baht? Yes please! Ordered my favorite shake of all time-- Papaya! Passed by this resto called APPLE Thai Fastfood and decided to eat lunch here! Parked our motorcyles here muna. Can you guess which one is ours? D ko rin alam eh. Haha. By the way, bike rental is 200-250 baht per day! They have set meals for only 95 baht!!! Their other dishes are also very affordable! Nico and I shared this meal! Grilled chicken skewer with fried rice and pad thai (not in photo). I think we paid 250 baht for everything. After lunch, we decided to go back to Thap Kaek (Tubkaek) Beach for sunset! Super duper low tide but push! See that alley on the right? That's where we came in. Didn't get the name of the resort. Am I in another planet? Nico, reading a book while waiting for sunset. Joke props lang yan. Wahaha. Sorry constipated mga once palang ako nag you know the whole trip. Namamahay talaga ako. Komang din po ako. Ayan wala nakong secrets sa inyo noh? Haha. It was a nice and pleasant ride! I super enjoyed the beautiful scenery. Can you see the temple on top? Tiger Cave Temple, also known as Wat Tham Sua, is a Buddhist temple based on the teaching of Vipassana. The temple was founded in 1975. Legend has it that a huge tiger used to live in the cave and made loud vicious roars once in a while. Later on, a group of Buddhist monks and nuns inhabited the cave to meditate and live. Since then, the huge tiger migrated to another mountain and had never set foot in the cave again. That is how the naming of “Tiger Cave Temple” came about. According to another legend, the naming of the temple actually refers to tiger paw marks found on the wall of the cave. Tiger Cave Temple is both a religious site and an archaeological site surrounded by mountains, caves, jungles, and forests. At the top of the mountain there is a 278-meter large golden Buddha statue that you can only reach through a 1,237 (but sign said 1,260) steps staircase. I know the climb may sound tedious but believe me, it's worth it! This is one of the best spots to get a panoramic view of the whole of town of Krabi. As an archaeological site, the temple is part of the many limestone caves in the area. The more well-known caves include Tum Chang Kaeo, Tum Lod, Tum Luk, and Tum Khon Than, on top of Wat Tham Sua itself. Walk around the area and you will see ancient artefacts including pottery remains, stone tools, molded Buddha footprints, as well as decorated skulls and skeletons. There are also many old and growing trees, including a 1000-year-old tree. Beware of monkeys around the area. They are pretty playful and can be a nuisance to tourists. Inside the tiger cave temple! No footwear allowed. Remember to dress respectfully! The foundation of the temple dates back to 1975 (B.E. 2518) when a Vipassana monk named Jumnean Seelasettho (Ajahn Jumnean) went to meditate in the cave. During his meditation, he witnessed tigers roaming around. This discovery led to naming the temple Wat Tham Suea. Another legend says that an actual huge tiger used to live and roam the cave and its paw prints were discovered on the walls. Throw a coin and make a wish! Okay, this is it! Ready to climb to the top! IMPORTANT TIP: Don't forget to bring drinking water and snacks (fruits or jelly-ace or anything that could give you more energy). There are lots of monkeys in the area and according to my research, they could be really aggressive. There are multiple reports where they bit people, so always be careful! I placed my backpack in front, hid all valuable items which could be snatched by them and ultimately just ignored them. They didn't bother me naman. Hihi. The stairs are steep and uneven so more effort and pagod! Whenever you're feeling tired, just stop, rest for a bit, and enjoy the beautiful view! Hulas!!! Can you see how much I'm sweating? Haha! They say that the best time to do the climb is sunrise and sunset for an awesome view! We did it before lunch so it was humid and hot. HUHU. Okay guys, before anything else, I'd like to say that I am not a fit person. I don't workout, I don't jog and I don't exercise. I also smoke. So the ascent was VERY challenging, and I almost gave up halfway through. But I've always been competitive and I am not one to give up easily. On my 700th step, I found myself walking alone. My companions decided not to continue anymore because one of them suddenly felt dizzy and then started throwing up from the heat and fatigue. The discussion to give up and just turn back was so tempting, but I thought, I am already halfway there so might as well continue. Lavarn bes! Susuka pero walang susuko! Haha. I was alone and thirsty and tired (and in need of a massage haha) but push lang! Almost there! I freakin' made it!!! Gaaah!!! Tip for a successful climb: Don't rush! Unless you're super fit and athletic then by all means, go. But for people like me, the secret is to stop once in a while and take all the rest you need especially when you feel your heart racing and you can't catch your breath. The climb might take a while but that's okay. Don't pressure yourself 'coz it is not a marathon okay? One of the reasons why I was able to make my way to the top, were all those kind strangers (of all ages!) who smiled at me and gave words of encouragement when I looked & felt like giving up. Patience and perseverance is key! Hehe. Also, don't forget to bring water! It's your lifesaver. It could be super hot and tiring so it's important to hydrate. We also brought banana for snacks (just make sure there are no monkeys around when you eat them!) which helped give me energy. ... after 15 minutes, Nico suddenly appeared!!!! I thought he already gave up 'coz he too headed down when our companions aborted their climb. Okay inom ka muna water. Water refilling station at the top of the mountain! Yey may taga picture nako! Haha. Small staircase leading to the tall golden Buddha statue, more shrines and footprints of Buddha. Shoes off! Tall golden Buddha which you could see from the road daw from afar! Footprint/s of Buddha! Ring the bell for luck. Equally grueling descent. My knees were trembling na coz of exhaustion haha. Nico's strategy was to go down backwards. Hehe. There's another set of stairs going up which lead to the other caves! We didn't go up na 'coz we were already hungry and tired. Hehe. Restaurant's name is MAMA KITCHEN. Nico and I ordered Pad Thai, Spicy Stir-fried Shrimp with chili and Stir-Fried Shrimp with Curry and we paid 170 baht for our meal. Gio & Harth ordered Batter-Fried Prawns, Shrimp Fried Rice and Curry Beef. Ao Nang street food market again for dinner! Ordered grilled snapper fish and shared it with the group. Retired early because our companions had to catch their early morning flight back to Manila the next day. 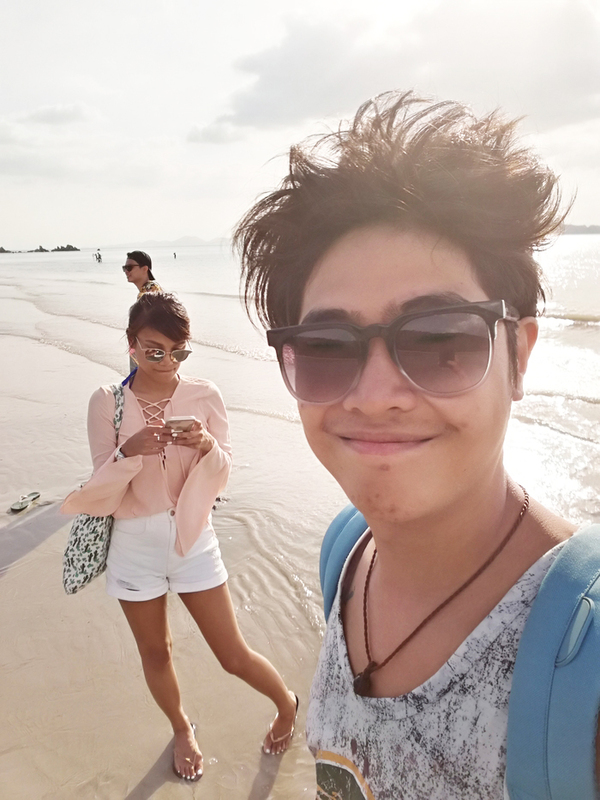 Meanwhile, we woke up late and spent our last day/night in Krabi just chilling and walking around. Our amazing 8 days in paradise has finally come to an end! I was actually more than ready to go 'coz one, we had no money na and two, my melanin has gone into overdrive. Sobrang itim ko na guys! Haha. Just taking it all in. :) What an amazing trip. Last sunset in Krabi. Can't wait to be back! Use my AIRBNB code when you sign-up to get free credits! Total KRABI Budget = P22,850!! !